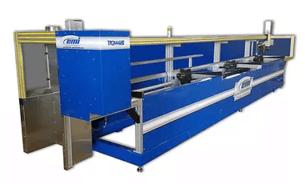 MI Tube Processing Centers – Take the “grudge” out of a grudge job! … but not any more! The EMI Tube Processing Center costs about 20% of even the least expensive laser systems, yet is 10 times as productive as traditional methods, with none of the aggravation. American-made throughout – hardware and software – with full service and parts support. EMI Tube Processing Centers cut by plasma using American-built HyperTherm torches and EMI “PieceMaker” software, which works seamlessly with TEKLA and other fabrication package, and takes all the guesswork and re-work out of these sometimes very tricky jobs. Parts are cut fast, clean and – most importantly – extremely accurately. No more grinding and fettling to make parts fit. Simply take the weld-ready components straight to the welding table, and you’re good to go! Tab and slot assemblies are easy to produce and save time in layout, fixturing and welding. 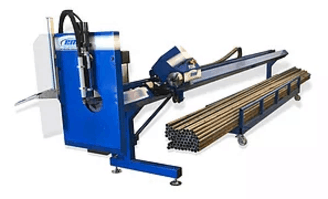 Holes, slots and weld-prep are created in line, simultaneously. Two models are available: 2100EL for miscellaneous metal shops doing handrails and similar out of round tube/pipe, and the more advanced 2400 series, which works with ‘SOLIDWORKS’ and ‘SigmaTube’ software, and offers greater flexibility in respect of material shapes which can be processed.